How will you judge the success of this website? What business goals do we need to achieve with this website? What are your bread and butter services that you want to promote? What is the target market and demographic we want to attract? By answering these questions, we create a marketing and communication strategy for your website. From our years of experience, we are able to help you create a successful website that achieves your business goals. We build the first 5 to 20 pages of your website. Your website is created with a clear call to action that gets prospective customers to make an appointment, purchase, call, visit or email. We incorporate your current marketing materials, videos and photos into the website and determine user-friendly navigation that is expandable as your business develops. HomeSpun Websites provides you a beautiful professional design that is customized to match your logo and branding elements. This responsive design works perfectly on mobile, tablet and desktop. Our goal is to get you to the top of the search engines for your services in your city! We make sure the text on your website is optimized with important keywords. We set up your Title Tags and use search engine friendly URLs. Our page speed is fast and scores well on search engine tests. We combine professional stock images with text and graphics to create a story. This is a fabulous way to introduce your business and deliver a powerful message. Enhance the look of your website with a custom header that combines your logo with clickable phone numbers, graphics and your call to action. A strong header improves conversions! We purchase and set up appropriate images that enhance the look of your website. Banners graphically enhance the look of the website and call visitors of the website to action. Actions include getting visitors to call, email, make a purchase, complete a form and more. 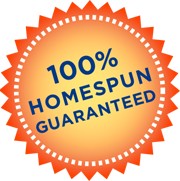 HomeSpun Websites has given me a website that produces results. My business went up over 90% after switching my website over to HomeSpun Websites. I had a working website but it just was just not getting me the results I needed. I have now quit my day job and I’m working full time doing what I love. I have made the transition to full time independent business owner. Bring your entrepreneurial spirit to Homespun websites and let them work their magic with your business. I only wish I had found them sooner. I want to thank the Staff at Homespun websites for treating my business like it was their own. My success is your success. I want to let everyone one know that their business will improve and get noticed with a HomeSpun Website. At HomeSpun Websites, we build long lasting relationships and believe in 100% customer satisfaction. If for some reason we do not hit the mark, we will switch you to another web designer or gladly refund your money. HomeSpun Websites LLC / Copyright 2018. Create the Perfect Website - Together.